My dad called me the other day. “Mom showed me your recent drawing on Facebook — my daughter’s got talent!” he exclaimed. The drawings in question were a response to a “B & W Challenge,” where I was supposed to post a black-and-white photo every day for five days. I desired to really challenge myself, so I opted to do five black-and-white drawings instead of photos. I did these works in a more realistic fashion than my paintings. When my sweet Papa — who has always encouraged me and always praised my work and meant no harm at all — said this of the drawings, I was a little bummed. Yes, making art that is realistic does take talent, but not imagination, and imagination is hard. Copying from reality is easier than doing a work of art that includes your feelings and personal interpretation and is more abstracted. Say what? Yup, it’s true, and here is why: When I do a realistic work, I am copying what already exists. I look at the photo in front of me and render it. The information is all there. I don’t have to use my imagination at all, just the skills they taught me in art school. Please understand that I’m not saying it doesn’t take skill to work realistically, I’m saying it doesn’t take creativity and imagination. I’m saying it’s a skill that can be taught. Imagination can only be exercised, but not taught. In college, there were the inevitable people who wanted to skip all the rules and move right into abstraction. I understood this. I, too, admired most painters who abstracted in some way, who were “painterly” in their approach, with a kind of freedom that hyper-realism doesn’t allow for. But I found quickly the abstract works by students who had not yet learned the rules lacked something; frankly, they lacked a lot. That knowledge goes deeply against that old saying “My kid could do that.” Abstract work done without skill doesn’t show up in your local museum; you can tell the difference. I remember thinking in art school that if I wanted to move into work that was more abstract and expressed more how I felt about something than what a camera might record, I had better learn the rules first. Learn the rules — then break the rules, from a place of knowing. It is the breaking of the rules that we modern artists spend the rest of our artistic journeys working on. It’s the exploration of ourselves in the backdrop of the idea or scene. The reinterpretation of what exists. What exists is already there; it’s your artistic interpretation that you must invent, and invention is hard. Cheers to the artistic process, the breaking of the rules, and the magic you find in between the two. *Before I sign off, I have to add that when I shared my disappointment and explanation with my dad, a former art student, he said, “I know all that, honey. I love your work — I just liked the surprise of these drawings!” Fair enough, Papa, fair enough! 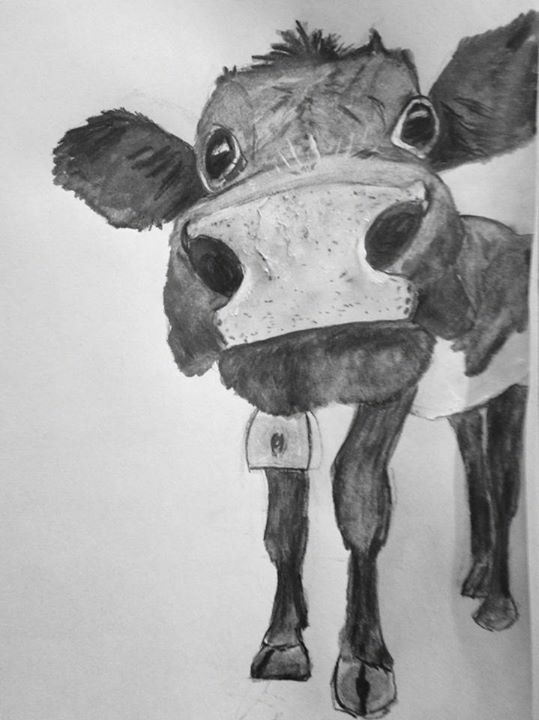 Day 2: … and more cow! 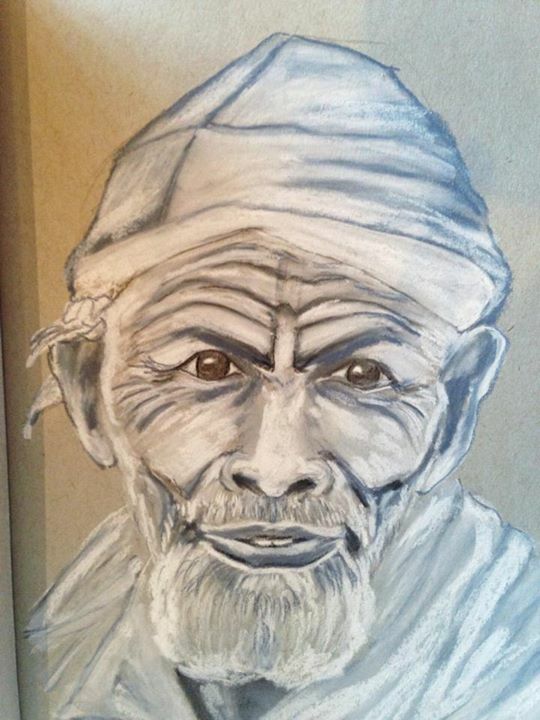 Day 4: My hubby took this mans photo in Ethiopia several years ago, and I have wanted to draw him ever since. I loved his quiet dignity and kind gaze, along with lines on his face that tell a story he was too young to be in a position of telling. Day 5: Another photo my sweetie took of a compelling face, this one from Italy. In America, we seem to have a problem with age, but I think we are wrong. It is these lines that compel, that tell a story of where we have been, what we have learned. These are the faces I most enjoy drawing. Faces with history. As they say, sometimes a picture is worth a thousand words. Enjoy!